You may renew items one time without visiting the library – either online or via phone. Once an item has been renewed by phone or online you may not renew again without bringing the items back to the library. Items must be renewed online before the due date. If the item is due, online renewal is not available and the student must come into the library to renew the materials. Connect to the wireless network TC GUEST. Open a web browser window to automatically view the Texarkana College TC GUEST Welcome Page. Enter your email address. It is not a requirement to use an @texarkanacollege.edu address. Read the Acceptable Use Protocol. TEXTING is encouraged, keep sound levels as low as possible. Cell Phone ring tones must be silenced inside the library; please set profile to vibrate. Answer quickly. Ask to return the call, then do so after exiting the library. All conversations must be conducted outside the building. 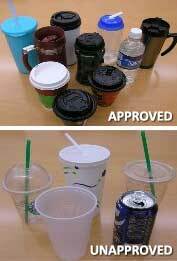 Only drinks in Approved (see photos below) containers are allowed in the library.